Denny Davis was a professor at Washington State University for 36 years, and is currently a Visiting Professor at The Ohio State University. He has always been interested in making improvements in his classroom; however, at first he did not realize it could be an area for scholarly work. 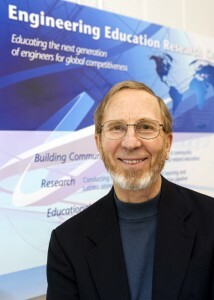 After becoming the Associate Dean of Undergraduate Programs in Engineering and Architecture, he began to formally conduct research in engineering design outcomes, curriculum, and assessment, as well as develop curriculum materials to increase the involvement of underrepresented K–12 students in mathematics, science, and engineering. Throughout his career, persistence and collaboration have been keys to his success. My first NSF-funded engineering education project focused on defining learning outcomes for engineering design. This was motivated by ABET accreditation discussions that were beginning to focus on learning outcomes rather than what is being taught. At that time, there was not a clear definition of the appropriate outcomes for engineering design. This became the area in which I have done the most work: developing curriculum and assessments for engineering design. My engineering education research has always been collaborative and multidisciplinary. At first my collaborators were people from engineering disciplines, and later have included people from education and business fields. For over twenty years, my collaborators and I have developed tools for enhancing learning and for assessment of design and professional skills (including communication, teamwork, professional responsibility, and self-initiated learning). I introduced our curricular and assessment innovations into my bioengineering design courses and into multidisciplinary capstone design courses. We developed modules that use instructional materials and formative assessments to help students improve their skills and summative assessments to measure final achievement. These innovations have impacted students from many engineering and non-engineering disciplines. We have found that course setup is important for motivating engineers to learn professional skills. Developing students’ professional skills in engineering is best achieved in the context of project-based classes structured for deep learning. We begin our capstone design class by making students aware that this will be a different kind of class. Everyone is going to be working together, learning in teams, and helping each other to develop team skills and professional skills as they complete their design project. The students are also informed that their course grade will be based not only on the project but also on their development of these professional skills. We assign grades based on this balance of outcomes to motivate students to work seriously on developing their professional skills. We support deep learning by providing instructional materials and assessments on the IDEALS website developed through our research grants. Educational materials are used in classroom activities and assigned as homework. These assignments give students opportunities to discuss professional skills concepts in a structured way that helps them understand terminology and principles. They practice principles by applying them to their projects, so their understanding is connected to actual projects. Periodically, students complete formative assessments that gauge their current understanding, challenges they face, and thoughts about how to improve skills. Feedback from instructors goes to individual students and to teams, so they can adjust their understanding and work as appropriate. We have observed impressive gains in student learning, teamwork, and project completion when they receive regular formative feedback. Yes, professional skills can be developed alongside project completion. After the first ten years in my faculty career, I had the opportunity to serve as an Associate Dean for Undergraduate Programs in Engineering and Architecture. This position allowed me to do formal engineering education research and to encourage others in doing similar work. My new responsibility had shifted my focus onto engineering education and the quality of learning. Part of the duties of the dean position was to work as a curriculum advisor for the statewide Mathematics, Engineering, Science Achievement (MESA) program. This program works with high school and middle school students who are underrepresented in engineering fields to generate greater interest in engineering. We used observations, retention data, and discussions amongst the staff at all sites to guide activity changes over time. As an administrator, you have opportunities to contribute to engineering education scholarship and to enable others to do so as well. In today’s environment, an administrator can work with faculty to identify ways to improve learning and retention in their programs, ask research questions, and facilitate data collection to obtain answers. One can also encourage other faculty to ask these questions and conduct research to find answers themselves. In many cases, you can provide seed money to begin research projects and help faculty compete for external grants to do more extensive research. You also can build collaborations across departments, schools, and colleges to create a research group of critical mass to have impact and to attract significant funding. You can be a catalyst for changing the image and impact of engineering education scholarship. When the employers of future graduates point out a skill that should be learned, they can influence change at the institution. I have seen administrators who are visionary and really pay attention to the quality of student learning but don’t get very far in implementing the change. However, influencers outside of the institution who are able to provide money or other resources for making desired changes can make it happen. New resources motivate change among faculty and administrators at higher levels in the institution, which sometimes aligns incentives for faculty to promote the desired change. For example, we would not have a commitment to assessment in our programs today if industry had not changed ABET accreditation requirements to include assessment. The Boeing Company has led the charge to refine our understanding of the abilities industry needs in graduates. They facilitated discussions of influential people from universities and other companies to define desired attributes of engineers. When I went to Boeing on a sabbatical leave just before the ABET 2000 criteria came out, I gained a much better understanding of the skills and abilities industry really needs. Being a pure academic, I had not understood many practical engineering and business issues before that experience. When I returned to campus, I immediately began to integrate business considerations into design and to promote multidisciplinary team experiences for engineering students. I think there are a lot of opportunities to collaborate with industry today, but building a relationship with a company can be difficult for academicians. This requires understanding what industry requires of our graduates. We often have our own agendas, and we look to industry to simply provide money for us to do what we want to do, but it is a two-way street. In fact, there are some NSF programs that require industry involvement in projects, and there is a lot encouragement for more entrepreneurial ventures. Just prior to my retirement, I reflected on my career and identified four entities that had contributed to my success: principles, passion, persistence, and people. The first is adhering to principles that support success. For example, when you are trying to change student learning, you need to understand principles of how students learn. You also need to understand and abide by principles that define how to live uprightly before God and human beings. The second important entity is passion—a passion for the kind of change or impact you want to accomplish. You can’t be lukewarm about it. Persistence is the third important entity. You must continue your pursuit, even when you don’t have the support of others. You must do what is necessary for accomplishing what you believe is most important, even in the face of opposition or lack of support. The last entity for success is people. You should find the right people to collaborate with. Over my lifetime, I have repeatedly seen God bring the right people to my attention at just the time I have needed them. The right people have been key to my success. It is important to mentor and advocate for the newcomers in the field. They will have more impact than what you can do yourself, especially if they get the chance to develop the deep understanding necessary to be successful in their areas of interest. I think part of my role in the field of engineering education has been one of facilitating the success of others. For example, at Washington State University, I attempted to help younger engineering faculty be accepted for doing education research by introducing them to one another, being an advocate for them, and helping them with grant proposals. They had the potential to go much further during their careers, if they could get the training and get off to a good start through mentoring. I began as a novice, not fully understanding what real scholarly work in engineering education was. I started more as a practitioner, just finding practical ways to make changes and bring about improved learning and student engagement in my courses. Over time, through attendance at conferences and reading scholarly publications, I began to realize there was a much more rigorous approach to engineering education. I needed deeper understanding of educational psychology and the ability to draw from previous work of the experts. It was a slow process, because I didn’t have a mentor. Navigating through engineering education research on your own can be challenging. Organizations like the American Society for Engineering Education (ASEE) are important for learning from each other and for building a network. In the state of Washington, we also had a very strong organization among the universities and community colleges that offer engineering programs. This gave us a network of people with similar interests within our state, bringing us together to discuss ideas and identify opportunities to collaborate on proposals. Some of my collaborators on my first NSF project were in this organization. In addition to formal networking and organizations, some people have just come along at the right time. I have seen amazing things happen as people have, in a sense, just dropped into my lap. When I needed someone to work with, the right people came along with the expertise needed. This is really what has kept me going during times when it seemed like there wasn’t a lot of support. Since retiring, I have continued to be active in engineering education. For example, I have begun preparing and marketing student workbooks and card decks to mentor students in design and professional skills development. (See VerityDesignLearning.com) I also coach high school students in FIRST Technical Challenge, where they learn technical and professional skills. Dr. Davis reflects that his engineering education research “has always been collaborative and multidisciplinary.” What other disciplines do you – or could you – draw on in your research? Dr. Davis identifies four things that have been important in his career: principles, passion, persistence, and people. What roles do you see each of these elements playing in your career? How can you support other scholars in these four areas? Photo provided by Dr. Davis. This project is funded in part by the National Science Foundation under Grant No. 1263512. Any opinions, findings, and conclusions or recommendations expressed in this material are those of the author(s) and do not necessarily reflect the views of the National Science Foundation. Proudly powered by WordPress (administrator login). Header image derived from Man Among Giants by Michael Matti.